This journal will publish review articles and original research that deal with a novel and very important area of biology. The ultimate objective is to understand the integrative regulation of higher organisms in their entire complexity. It has been firmly established already that the Nervous, Endocrine and Immune systems form a regulatory network, a Super-System, which governs all events from conception till death in higher animals and in man, including physiological and pathophysiological processes. It follows from the above definition that a review journal covering this area of Biomedicine must operate in a “multidisciplinary” fashion. The rapidly accumulating and fragmented information available today will be collected, organized and interpreted; the elements, compounds, cells and tissues will be fitted into living organisms and our knowledge of the biology of such higher organisms will be enhanced. The rules of physiological interactions during homeostasis must be understood and also the regulatory interactions in diseases must be followed, which operate during pathophysiological conditions (allostasis). One might raise the objection that Advances in Neuroimmune Biology aspire for too much and eventually will catch very little. This is why the editors have to examine carefully each topic and project. Yes, this science is multi-disciplinary, but they restrict themselves to study integrative mechanisms/pathways exclusively. If a topic/project does not deal with the subject area in an integrative manner, it will not be considered for publication. A panel of outstanding scientists have given their support to this proposal and agreed to serve on the Editorial Board. The editors will review papers, will be expected to contribute articles, plan actively and edit certain issues, and will also be active in soliciting new articles from fellow scientists. The primary audience will be scientists working in physiology, endocrinology, immunology, pathology, medicine and in similar areas of veterinary medicine and of biology. Zoologists should also be interested as lower animals also have integrative coordinating mechanisms to organize their biology. The secondary audience would come from doctors of medicine and veterinary medicine, practicing biologists, etc. At a certain level parents, even animal breeders, and the general public should also be interested. Amongst the problems this journal will present are the stress response and its biological significance. These questions have fundamental importance to modern society and to proper health care. 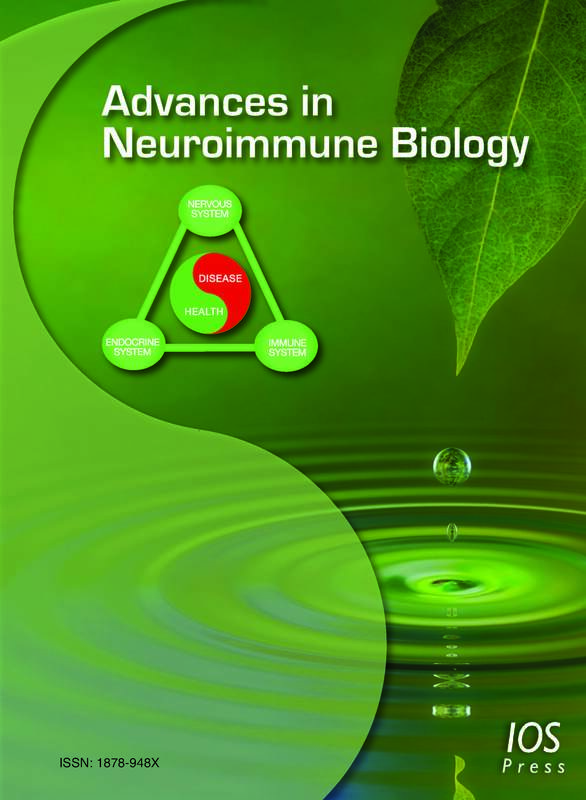 Clearly, the systematic presentation of Neuroimmune Biology is very much in need in modern societies. Note that the manuscript should be uploaded as one file with tables and figures included. This file can be a Word document, a PDF, or a zip file (.rar) if separate high resolution figures or a supplemental file such as a video are also to be included with the submission (the file size maximum is 25MB). We recommend that the cover letter includes the names and email addresses of 3-5 potential reviewers knowledgeable in the area of the study and potential reviewer conflicts. Resubmissions should include the manuscript number and a point-by-point response to the previous reviews in the cover letter. The point-by-point response can also be included at the beginning of the manuscript to maintain formatting. IOS Press grants authors permission to supply the final manuscript version to PubMed Central at no charge. The guidelines for PubMed Central submission can be found here. under submission Method C.
Authors who have paid the Open Access fee may freely deposit the final published PDF in PubMed Central. It is possible to have figures printed in colour, provided the cost of their reproduction is paid for by the author. The charges will be specified with the proof delivery. Online the figures will be published in full colour at no charge. Permissions for use of materials published in NIB Reports (figures, tables, thesis publication) can be requested at publisher@iospress.nl. What Makes a Successful Pregnancy?